This article is about the German men's football league. For the German women's football league, see Frauen-Bundesliga. For other uses, see Bundesliga (disambiguation). The Bundesliga (German: [ˈbʊndəsˌliːɡa] ( listen); lit. English: "Federal League", sometimes referred to as the Fußball-Bundesliga [ˌfuːsbal-] or 1. Bundesliga [ˌʔeːɐ̯stə-]) is a professional association football league in Germany and the football league with the highest average stadium attendance worldwide. At the top of the German football league system, the Bundesliga is Germany's primary football competition. The Bundesliga comprises 18 teams and operates on a system of promotion and relegation with the 2. Bundesliga. Seasons run from August to May. Most games are played on Saturdays and Sundays, with a few games played on weekdays. All of the Bundesliga clubs qualify for the DFB-Pokal. The winner of the Bundesliga qualifies for the DFL-Supercup. 54 clubs have competed in the Bundesliga since its founding. Bayern Munich has won the Bundesliga the most, winning the title 27 times. However, the Bundesliga has seen other champions with Borussia Dortmund, Hamburger SV, Werder Bremen, Borussia Mönchengladbach and VfB Stuttgart most prominent among them. The Bundesliga is one of the top national leagues, ranked fourth in Europe according to UEFA's league coefficient ranking for the 2017–18 season, based on performances in European competitions over the past five seasons. 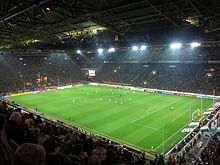 The Bundesliga is the number-one football league in the world in terms of average attendance; out of all sports, its average of 45,134 fans per game during the 2011–12 season was the second highest of any sports league in the world after the American National Football League. The Bundesliga is broadcast on television in over 200 countries. The Bundesliga was founded in 1962 in Dortmund and the first season started in 1963. The structure and organisation of the Bundesliga along with Germany's other football leagues have undergone frequent changes. The Bundesliga was founded by the Deutscher Fußball-Bund (English: German Football Association), but is now operated by the Deutsche Fußball Liga (English: German Football League). The Bundesliga is composed of two divisions: the 1. Bundesliga (although it is rarely referred to with the First prefix), and, below that, the 2. Bundesliga (2nd Bundesliga), which has been the second tier of German football since 1974. The Bundesligen (plural) are professional leagues. Since 2008, the 3. Liga (3rd League) in Germany has also been a professional league, but may not be called Bundesliga because the league is run by the German Football Association (DFB) and not, as are the two Bundesligen, by the German Football League (Deutsche Fußball-Liga or DFL). Below the level of the 3. Liga, leagues are generally subdivided on a regional basis. For example, the Regionalligen are currently made up of Nord (North), Nordost (Northeast), Süd (South), Südwest (Southwest) and West divisions. Below this are thirteen parallel divisions, most of which are called Oberligen (upper leagues) which represent federal states or large urban and geographical areas. The levels below the Oberligen differ between the local areas. The league structure has changed frequently and typically reflects the degree of participation in the sport in various parts of the country. In the early 1990s, changes were driven by the reunification of Germany and the subsequent integration of the national league of East Germany. A greater share of television broadcast licence revenues goes to 1. Bundesliga sides. 1. Bundesliga teams draw significantly greater levels of fan support. Average attendance in the first league is 42,673 per game — more than twice the average of the 2. Bundesliga. Greater exposure through television and higher attendance levels helps 1. Bundesliga teams attract the most lucrative sponsorships. 1. Bundesliga teams develop substantial financial muscle through the combination of television and gate revenues, sponsorships and marketing of their team brands. This allows them to attract and retain skilled players from domestic and international sources and to construct first-class stadium facilities. The 1. Bundesliga is financially strong, and the 2. Bundesliga has begun to evolve in a similar direction, becoming more stable organizationally and financially, and reflecting an increasingly higher standard of professional play. Internationally, the most well-known German clubs include Bayern Munich, Borussia Dortmund, Schalke 04, Hamburger SV, VfB Stuttgart, Borussia Mönchengladbach, Werder Bremen and Bayer Leverkusen. Hamburger SV was the only club to have played continuously in the Bundesliga since its foundation until 12 May 2018, when the club was relegated for the first time. The bottom two finishers in the Bundesliga are automatically relegated to the 2. Bundesliga, with the top two finishers in the 2. Bundesliga taking their places. The third-from-bottom club in the Bundesliga will play a two-legged tie with the third-place team from the 2. Bundesliga, with the winner taking up the final place in the following season's Bundesliga. From 1992 until 2008, a different system had been used in which the bottom three finishers of the Bundesliga had been automatically relegated, to be replaced by the top three finishers in the 2. Bundesliga. 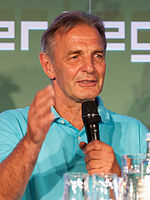 From 1963 until 1981 two, or later three, teams had been relegated from the Bundesliga automatically, while promotion had been decided either completely or partially in promotion play-offs. The season starts in early August and lasts until late May, with a winter break of six weeks (mid-December through to the end of January). In recent years, games have been played on Saturdays (five games beginning at 3:30 pm and one game beginning at 6:30 pm) and Sundays (one game beginning at 3:30 pm and one game at 5:30 pm). A new television deal in 2006 reintroduced a Friday game (beginning at 8:30 pm). Prior to the formation of the Bundesliga, German football was played at an amateur level in a large number of sub-regional leagues until, in 1949, part-time (semi-) professionalism was introduced and only five regional Oberligen (Premier Leagues) remained. Regional champions and runners-up played a series of playoff matches for the right to compete in a final game for the national championship. On 28 January 1900, a national association, the Deutscher Fußball Bund (DFB) had been founded in Leipzig with 86 member clubs. The first recognised national championship team was VfB Leipzig, who beat DFC Prague 7–2 in a game played at Altona on 31 May 1903. Meanwhile, in East Germany, a separate league was established with the formation of the DS-Oberliga (Deutscher Sportausschuss Oberliga) in 1950. The league was renamed the Football Oberliga DFV in 1958 and was generally referred to simply as the DDR-Liga or DDR-Oberliga. The league fielded 14 teams with two relegation spots. The defeat of the national team by Yugoslavia (0–1) in a 1962 World Cup quarter-final game in Chile was one impetus (of many) towards the formation of a national league. At the annual DFB convention under new DFB president Hermann Gösmann (elected that very day) the Bundesliga was created in Dortmund at the Westfalenhallen on 28 July 1962 to begin play starting with the 1963–64 season. At the time, there were five Oberligen (Premier Leagues) in place representing West Germany's North, South, West, Southwest, and Berlin. East Germany, behind the Iron Curtain, maintained its separate league structure. 46 clubs applied for admission to the new league. 16 teams were selected based on their success on the field, economic criteria and representation of the various Oberligen. The first Bundesliga games were played on 24 August 1963. Early favourite 1. FC Köln was the first Bundesliga champion (with 45:19 points) over second place clubs Meidericher SV and Eintracht Frankfurt (both 39:25). Following German reunification, the East German leagues were merged into the West German system. Dynamo Dresden and F.C. Hansa Rostock were seeded into the top-tier Bundesliga division, with other clubs being sorted into lower tiers. The German football champion is decided strictly by play in the Bundesliga. Each club plays every other club once at home and once away. Originally, a victory was worth two points, with one point for a draw and none for a loss. Since the 1995–96 season, a victory has been worth three points, while a draw remains worth a single point, and zero points are given for a loss. The club with the most points at the end of the season becomes German champion. Currently, the top three clubs in the table qualify automatically for the group phase of the UEFA Champions League, while the fourth-place team enters the Champions League at the third qualifying round (see overview). The two teams at the bottom of the table are relegated into the 2. Bundesliga, while the top two teams in the 2. Bundesliga are promoted. The 16th-placed team (third-last), and the third-placed team in the 2. Bundesliga play a two-leg play-off match. The winner of this match plays the next season in the Bundesliga, and the loser in the 2. Bundesliga. Until the 2016–17 season, an additional place in the Europa League could also be granted via the UEFA Fair Play mechanism. This rule was maintained from the UEFA Cup. The last Bundesliga team to gain entry to the UEFA Cup via the fair play rule was Mainz 05 in 2005–06. Until 2015–16, if the Cup winner qualified for the Champions League, the cup winner's place in the Europa League went to the defeated cup finalist if it had not already qualified for European competition, although the defeated cup finalist would enter the competition a stage earlier than if it had won the Cup. This rule was retained from the Europa League's predecessor, the UEFA Cup. From 2015–16, the runners-up no longer qualify for the Europa league and the Europa League berth reserved for the DFB-Pokal winners is transferred to the highest finisher below the Champions League qualification places. Prior to 2015–16, the team that benefited from that rule did not necessarily have to be a Bundesliga member. For example, although 2. Bundesliga sides Alemannia Aachen lost to Werder Bremen in the 2004 DFB-Pokal Final, Alemannia secured an entry in the 2004–05 UEFA Cup, because Werder qualified for the Champions League as First Bundesliga champions. The number of German clubs which may participate in UEFA competitions is determined by UEFA coefficients, which take into account the results of a particular nation's clubs in UEFA competitions over the preceding five years. Up to and including 1996–97: German champion only. 1997–99: Top two teams; champions automatically into group phase, runners-up entered the qualifying round. 1999–2008: Top two teams automatically into first group phase (only one group phase starting in 2003–04). Depending on the DFB's UEFA coefficients standing, either one or two other clubs (most recently one) entered at the third qualifying round; winners at this level entered the group phase. 2008–2011: Top two teams automatically into group phase. Third placed team had to play in the play-off round for the right to play in the group stage. From 1971–72 to 1998–99, UEFA member nations could send between one and four teams to the UEFA Cup. Germany was always entitled to send at least three teams to the competition and often as many as four. From 1978–79, the number of participants was determined by the DFB's UEFA coefficient standing, prior to this the method for deciding the number of participants is unknown. The best performing teams in the league other than the champion would qualify, although if one of these teams was also winner of the DFB-Pokal then they would enter the Cup Winners' Cup instead and their UEFA Cup place would be taken by the next highest-placed team in the league (5th or 6th place). 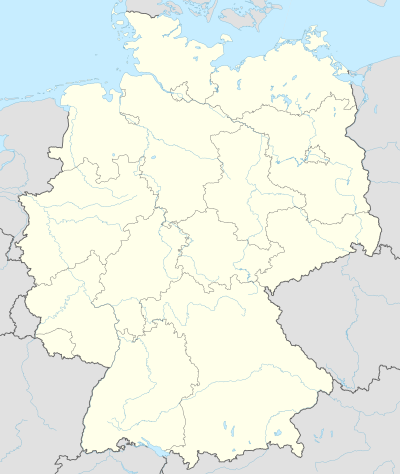 Briefly in the mid-1970s the DFB decided to allocate the last UEFA Cup place to the DFB-Pokal runner-up instead of a third or fourth team qualified by performance in the league, meaning that at this point the DFB-Pokal qualified two teams for European competition (winners for the Cup Winners' Cup, runners-up for the UEFA Cup). This policy was unique amongst UEFA member associations and was dropped after only a few seasons. Starting with the 1999–2000 season and the abolition of the Cup Winners' Cup (which was then folded into the UEFA Cup), the DFB-Pokal winner now automatically qualified for the UEFA Cup alongside, depending on the DFB's UEFA coefficients standing, between one and three extra participants (if the DFB-Pokal winner also qualified for the Champions League, they were replaced by the DFB-Pokal runner-up; if they were also qualified for the Champions League, the UEFA Cup place went to the next best placed team in the league not otherwise qualified for European competition). Since 1999, the DFB has always been entitled to enter a minimum of three clubs in the UEFA Cup/Europa League, and at times as many as four (the maximum for any European federation). Teams that entered via UEFA's Fair Play mechanism, or those that entered through the now-defunct Intertoto Cup, did not count against the national quota. From 2006 through the final Intertoto Cup in 2008, only one First Bundesliga side was eligible to enter the Intertoto Cup and possibly earn a UEFA Cup berth. For the 2005–06 season, the DFB earned an extra UEFA Cup place via the Fair Play draw; this place went to Mainz 05 as the highest-ranked club in the Fair Play table of the First Bundesliga not already qualified for Europe. The winner of the DFB-Pokal entered the Cup Winners' Cup, unless that team was also league champion and therefore competing in the European Cup/Champions League, in which case their place in the Cup Winners' Cup was taken by the DFB-Pokal runner-up. Today, the DFB-Pokal winner (if not otherwise qualified for the Champions League) enters the UEFA Europa League. In the 2009–10 season, the Bundesliga's turnover was €1.7bn, broken down into match-day revenue (€424m), sponsorship receipts (€573m) and broadcast income (€594m). That year it was the only European football league where clubs collectively made a profit. Bundesliga clubs paid less than 50% of revenue in players wages, the lowest percentage out of the European leagues. The Bundesliga has the lowest ticket prices and the highest average attendance out of Europe's five major leagues. The Allianz Arena, home venue of Bayern Munich, was the first stadium in the world with a full colour changing exterior. Bundesliga clubs tend to form close associations with local firms, several of which have since grown to big global companies; in a comparison of the leading Bundesliga and Premiership clubs, Bayern Munich received 55% of its revenue from company sponsorship deals, while Manchester United got 37%. Bundesliga clubs are required to be majority-owned by German club members (known as the 50+1 rule [de] to discourage control by a single entity) and operate under tight restrictions on the use of debt for acquisitions (a team only receives an operating license if it has solid financials), as a result 11 of the 18 clubs were profitable after the 2008–09 season. By contrast, in the other major European leagues, numerous high-profile teams have come under ownership of foreign billionaires, and a significant number of clubs have high levels of debt. Exceptions to the 50+1 rule allow Bayer Leverkusen, 1899 Hoffenheim, and VfL Wolfsburg to be owned by corporations or individual investors. In the cases of Bayer Leverkusen and Wolfsburg, the clubs were founded by major corporations (respectively Bayer AG and Volkswagen) as sports clubs for their employees, while Hoffenheim has long received its primary support from SAP co-founder Dietmar Hopp, who played in the club's youth system. After 2000 the German Football Association and the Bundesliga mandated that all clubs run a youth academy, with the aim of bolstering the stream of local talent for the club and national team. As of 2010 the Bundesliga and second Bundesliga spend €75m a year on these youth academies, that train five thousand players aged 12–18, increasing the under-23-year-olds in the Bundesliga from 6% in 2000 to 15% in 2010. This allows more money to be spent on the players that are bought, and there is a greater chance to buy better instead of average players. In the first decade of the third millennium (2000s), the Bundesliga was regarded as competitive, as five teams have won the league title. This contrasted with Spain's La Liga, dominated by the "Big Two" of Barcelona and Real Madrid, the English Premier League dominated by a "Big Four" (Manchester United, Chelsea, Liverpool, and Arsenal), as well as France's Ligue 1, won seven consecutive years by Lyon. In the second decade, however, a resurgent Bayern Munich has won each year from 2012–13 onward as the Bavarian side is able to outspend its rivals to purchase the league's best players. For a number of years, the clubs in the Bundesliga have been subject to regulations not unlike the UEFA Financial Fair Play Regulations agreed upon in September 2009. At the end of each season, clubs in the Bundesliga must apply to the German Football Federation (DFB) for a licence to participate again the following year; only when the DFB, who have access to all transfer documents and accounts, are satisfied that there is no threat of insolvency do they give approval. The DFB have a system of fines and points deductions for clubs who flout rules and those who go into the red can only buy a player after selling one for at least the same amount. In addition, no individual is allowed to own more than 49 percent of any Bundesliga club, the only exceptions being VfL Wolfsburg, Bayer Leverkusen and current Regionalliga Nordost member FC Carl Zeiss Jena should they ever be promoted to the Bundesliga as they were each founded as factory teams. The Commerzbank Arena, is the home ground of Eintracht Frankfurt. Despite the good economic governance, there have still been some instances of clubs getting into difficulties. In 2004, Borussia Dortmund reported a debt of €118.8 million (£83 million). Having won the Champions League in 1997 and a number of Bundesliga titles, Dortmund had gambled to maintain their success with an expensive group of largely foreign players but failed, narrowly escaping liquidation in 2006. In subsequent years, the club went through extensive restructuring to return to financial health, largely with young home-grown players. In 2004 Hertha BSC reported debts of £24.7 million and were able to continue in the Bundesliga only after proving they had long term credit with their bank. The leading German club Bayern Munich made a net profit of just €2.5 million in 2008–09 season (group accounts, while Schalke 04 made a net loss of €30.4 million in 2009 financial year. Borussia Dortmund GmbH & Co. KGaA, made a net loss of just €2.9 million in 2008–09 season. 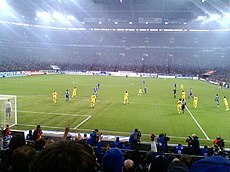 Based on its per-game average, the Bundesliga is the best-attended association football league in the world; out of all sports, its average of 45,116 fans per game during the 2011–12 season was the second highest of any professional sports league worldwide, behind only the National Football League of the United States. Bundesliga club Borussia Dortmund has the highest average attendance of any football club in the world. Out of Europe's five major football leagues (Premier League, La Liga, Ligue 1, and Serie A ), the Bundesliga has the lowest ticket prices and the highest average attendance. Many club stadia have large terraced areas for standing fans (by comparison, stadia in the English Premier League are all-seaters due to the Taylor Report). Teams limit the number of season tickets to ensure everyone has a chance to see the games live, and the away club has the right to 10% of the available capacity. Match tickets often double as free rail passes which encourages supporters to travel and celebrate in a relaxed atmosphere. According to Bundesliga chief executive Christian Seifert, tickets are inexpensive (especially for standing room) as "It is not in the clubs' culture so much [to raise prices]. They are very fan orientated". Uli Hoeneß, president of Bayern Munich, was quoted as saying "We do not think the fans are like cows to be milked. Football has got to be for everybody." The Bundesliga has the highest average attendance of any football league in the world. Borussia Dortmund has the highest average attendance at Signal Iduna Park of any football club in the world. The Bundesliga TV, radio, internet, and mobile broadcast rights are distributed by DFL Sports Enterprises, a subsidiary of the Deutsche Fußball Liga. The Bundesliga broadcast rights are sold along with the broadcast rights to the Bundesliga Relegation Playoffs, 2. Bundesliga and DFL-Supercup. From 2017–18 to 2020–21, Bundesliga matches are broadcast on TV in Germany on Sky Germany and Eurosport. Three Friday night matches – the openers of the first and second halves of the season, and on the final matchday before the winter break – are broadcast to all Germans on ZDF. Radio coverage includes the national Konferenz (whip-around coverage) on the stations of ARD and full match coverage on local radio stations. The Bundesliga is broadcast on TV in over 200 countries. In October 2013, 21st Century Fox, via the Fox Sports, Fox International Channels, and Sky plc divisions, acquired television and digital rights to the Bundesliga in 80 territories, including North America and Asia (outside of India and Oceania) for five years, and selected European territories for two years, beginning in the 2015–16 season. CEO James Murdoch explained that the deal was designed to "leverage our unrivaled global portfolio of sports channels to bolster the Bundesliga brand in every corner of the globe." As a result of this partnership, Fox Sports replaced GOL TV as United States rightsholder beginning in the 2015–16 season. Matches are broadcast by Fox, Fox Sports 1, Fox Sports 2, and Fox Soccer Plus in English, Spanish-language telecasts air on Fox Deportes and Univision Deportes (from 2018/19 season). Matches stream online for subscribers to these channels on participating providers via Fox Sports Go, and are also available through the subscription service Fox Soccer Match Pass. In Canada, broadcast rights were sub-licensed to Sportsnet and Sportsnet World. In the United Kingdom and in Ireland, the Bundesliga is broadcast live on BT Sport. ITV4 broadcasts delayed highlights the following Monday. This arrangement lasts through the 2017 season. In Spain, the Bundesliga is broadcast live on Movistar+. In 2015, digital TV operator StarTimes acquired exclusive television rights for Sub-Saharan Africa for 5 years starting from 2015-2016 season. In total, 43 clubs have won the German championship, including titles won before the Bundesliga's inception and those in the East German Oberliga. The record champions are Bayern Munich with 27 titles, ahead of BFC Dynamo Berlin with 10 (all in East Germany) and 1. FC Nürnberg with 9. The following 12 clubs have won the Bundesliga: Bayern Munich (27 titles), Borussia Mönchengladbach and Borussia Dortmund (5), Werder Bremen (4), Hamburger SV and VfB Stuttgart (3), 1. FC Köln and FC Kaiserslautern (2), TSV 1860 Munich, Eintracht Braunschweig, 1. FC Nürnberg and VfL Wolfsburg (1). No club from former East Germany or Berlin has won the Bundesliga. In 2004, the honour of "Verdiente Meistervereine" (roughly “distinguished champion clubs”) was introduced, following a custom first practised in Italy to recognize sides that have won multiple championships or other honours by the display of gold stars on their team badges and jerseys. Each country's usage is unique and in Germany the practice is to award one star for three titles, two stars for five titles, three stars for 10 titles, and four stars for 20 titles. The former East German side Dynamo Berlin laid claim to the three stars of a 10-time champion. They petitioned the league to have their DDR-Oberliga titles recognized, but received no reply. Dynamo eventually took matters into their own hands and emblazoned their jerseys with three stars. This caused some debate given what may be the tainted nature of their championships under the patronage of East Germany's secret police, the Stasi. The issue also affects other former East German and pre-Bundesliga champions. In November 2005, the DFB allowed all former champions to display a single star inscribed with the number of titles, including all German men's titles since 1903, women's titles since 1974 and East German titles. The DFB format only applies to teams playing below the Bundesliga (below the top two divisions), since the DFL conventions apply in the Bundesliga. BFC Dynamo Berlin have not followed this guideline and continue to wear three stars, rather than a single star inscribed with the number 10. Greuther Fürth unofficially display three (silver) stars for pre-war titles in spite of being in the Bundesliga second division. These stars are a permanent part of their crest. However, Fürth has to leave the stars out on their jersey. Since June 2010, the following clubs have been officially allowed to wear stars while playing in the Bundesliga. The number in parentheses is for Bundesliga titles won. In addition, a system of one star designation was adopted for use. This system is intended to take into account not only Bundesliga titles but also other (now defunct) national championships. As of July 2014, the following clubs are allowed to wear one star while playing outside the Bundesliga. The number in parentheses is for total league championships won over the course of German football history, and would be displayed within the star. Some teams listed here had different names while winning their respective championships, these names are also noted in parentheses. For the first time in 1996, the Bundesliga was given its own logo to distinguish itself. Six years later, the logo was revamped into a portrait orientation, which was used until 2010. A new logo was announced for the 2010–11 season in order to modernise the brand logo for all media platforms. To celebrate the 50th anniversary of the Bundesliga, a special logo was developed for the 2012–13 season, featuring a "50" and "1963–2013". Following the season, the 2010 logo was restored. In December 2016, it was announced that a new logo would be used for the 2017–18 season, modified slightly for digitisation requirements, featuring a matte look. Boldface indicates a player still active in the Bundesliga. ^ "UEFA Country Ranking 2015". kassiesa.home.xs4all.nl. Bert Kassies. n.d. Retrieved 4 November 2015. ^ a b Cutler, Matt (15 June 2010). "Bundesliga attendance reigns supreme despite decrease". Sport Business. Retrieved 4 January 2012. ^ "How everything got started". bundesliga.de. Archived from the original on 16 July 2007. ^ "Stadiums in Germany". World stadiums. World stadiums. Retrieved 8 September 2018. ^ a b c d Jackson, Jamie (11 April 2010). "How the Bundesliga puts the Premier League to shame". Guardian. Retrieved 30 May 2013. ^ a b c Evans, Stephen (23 May 2013). "BBC News – German football model is a league apart". Bbc.co.uk. Retrieved 30 May 2013. ^ a b c d Weil, Jonathan (23 May 2013). "At Last, Germany Secures Total Dominance of Europe". Bloomberg. Retrieved 30 May 2013. ^ a b c d Weil, Jonathan (22 May 2013). "Has German Soccer Conquered Europe? Not Quite". Bloomberg. Retrieved 30 May 2013. ^ Hesse, Uli (30 December 2014). "Issues looming for Germany's footballing landscape". ESPN.com. Retrieved 8 March 2015. ^ Lowe, Sid (4 May 2013). "Barcelona and Real Madrid are symbolic of Spain's pain". The Guardian. Retrieved 14 July 2013. ^ Bennett, John (23 January 2014). "Are brilliant Bayern Munich making the Bundesliga boring?". BBC. British Broadcasting Corporation. Retrieved 23 August 2014. ^ "Bayern Munich: Bundesliga champions in numbers". BBC. British Broadcasting Corporation. 26 March 2014. Retrieved 23 August 2014. ^ "Schalke unveil 2009 financials: debt repayment and firm footballing foundations go hand in hand". Archived from the original on 20 August 2012. Retrieved 7 July 2014. ^ "Watch" (PDF). FutbolYou-Bundesliga (in German). Retrieved 14 April 2015. ^ "2011–12 World Football Attendances – Best Drawing Leagues (Chart of Top-20-drawing national leagues of association football) / Plus list of 35-highest drawing association football clubs in the world in 2011–12". ^ "The core functions of the DFL". ^ "21st Century Fox Takes Global Rights to German Soccer League". The Hollywood Reporter. Retrieved 31 July 2015. ^ "Rupert Murdoch buys further Bundesliga broadcast rights". DW. Retrieved 31 July 2015. ^ "Univision Deportes seals Bundesliga sublicensing deal with Fox - SportsPro Media". www.sportspromedia.com. Retrieved 19 March 2019. ^ "Bundesliga is getting strong coverage package on FOX Sports". SBNation. Retrieved 31 July 2015. ^ "Fox Sports 2015–16 Bundesliga television schedule". Philadelphia Inquirer. Retrieved 31 July 2015. ^ "Watch Germany's Bundesliga on Sportsnet". Sportsnet.ca. Rogers Media. Retrieved 31 July 2015. ^ "BT Sport extends Bundesliga rights deal until 2017". BT Sport. British Telecom. Retrieved 31 July 2015. ^ "StarTimes confirms Bundesliga deal". Sport Industry Group. Retrieved 13 July 2017. ^ "Honours". FC Bayern Munich. Retrieved 2 November 2016. ^ "Deutsche Meister der Männer" (in German). dfb.de. Archived from the original on 29 March 2014. Retrieved 4 January 2012. ^ "FIFA awards special 'Club World Champion' badge to AC Milan". FIFA.com. FIFA. 7 February 2008. Retrieved 8 August 2015. ^ "6 Durchführungsbestimmungen" [6 Implementing regulations] (PDF) (in German). p. 52. Archived from the original (PDF) on 9 May 2013. ^ "Bundesliga mit neuem Markenauftritt zur Saison 2010/2011" [Bundesliga with a new brand image for the 2010–11 season]. Bundesliga (in German). Deutsche Fußball Liga. 6 May 2010. Retrieved 28 December 2016. ^ "DFL und adidas feiern 50 Jahre Bundesliga: Neues Logo und neuer Ball zum Jubiläum" [DFL and adidas celebrate 50 years of the Bundesliga: New logo and new ball for the anniversary]. Bundesliga (in German). Deutsche Fußball Liga. 4 May 2012. Retrieved 28 December 2016. ^ "Bundesliga: New brand look from 2017/18 season". Bundesliga. Deutsche Fußball Liga. 12 December 2016. Retrieved 28 December 2016. ^ "Germany – All-Time Most Matches Played in Bundesliga". RSSSF. 21 July 2011. Retrieved 4 January 2012. ^ "(West) Germany – Top Scorers". RSSSF. 21 July 2011. Retrieved 4 January 2012.